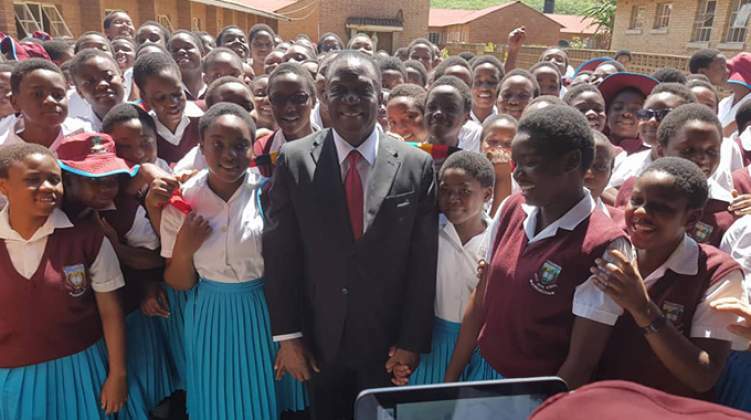 PRESIDENT Mnangagwa on Saturday made a surprise visit to Monte Cassino Mission School in Macheke where he urged teachers and pupils to maintain the high standards of education that have seen school outstandingly performing in public examinations. The girl's school is always among the top performing schools according to the Zimbabwe Schools Examination Council (ZIMSEC) ratings published annually. The unusual weekend visit caught staff members by surprise as some teachers had to attend the gathering while clad in shorts and T-shirts. President Mnangagwa visited the Roman Catholic institution in the company Vice-President Constantino Chiwenga. Addressing the gathering, President Mnangagwa hailed the school for the outstanding performance. "I am happy that you look happy despite being in this period of examinations. It means you are doing well. "In fact, I always look at the results of Monte Cassino every year and you are doing very well. I give credit to the sisters who teach you. I urge you to keep the record high," said the President. The Head of State and Government and the Commander-In-Chief of the Zimbabwe Defence Forces said his Government was determined to improving the country's education and to create jobs for the talented youth. "The future we are doing our best to prepare now, is yours. We have had our time but now, we are doing our best under the Second Republic to create an environment, educationally and scientifically, for the younger generation to have a better future than ourselves. "We can assure you that those among you, who would want to be ministers, the space is there. Those who want to be pilots or lawyers like me, the space is there," he said. He added jokingly: "Those who want to be presidents, the space is narrow." The President said the Government was working towards creating an environment where talent is rewarded. It was indeed a happy day for the pupils, most of them, meeting the President for the first time at such close range. President Mnangagwa urged the children to remain united and to plough back to their societies after leaving school. "Indeed, we want to keep the flame of hope, the flame of love, the flame of unity, the flame of peace burning in Zimbabwe. Only with such a stable condition in the country, can we prosper, can we mobilise, can we industrialise and create a life where you enjoy yourselves and satisfy your aspirations. "For the same reason, you must ask yourselves: What contribution am I making to my country? "What contribution am I making to my community? When you leave this world, you should leave behind a legacy of having helped the community that brought you up," he said.